Includes 1/2" Magnum® Drill, 0-850 RPM w/ All-Metal Keyless Chuck - 0302-80, Side Handle, Product Manual. POWER is the word! I was on a ladder drilling with a 4" hole saw overhead. You can see where this is leading. Use to wimpy 18 volt guns I was 1 handing it when hole saw hooked up and stopped! My new magnum however kept on turning. I hung on for 1 turn and got clobbered on the following 2! I love my drill! It broke my wrist and I still say it's the best! It's the Top-Fueler's of screw guns. The 302's long fault is that it needs a cord. I have had this drill for 3 years and I don't use it much. I use my cordless drills including my powerful Dewalt 988. Milwalkee 302,it drilled It with ease and didn't even slow down. light to fairly heavy use (about 95% of the time). Why put unneeded strain on a good cordless drill? 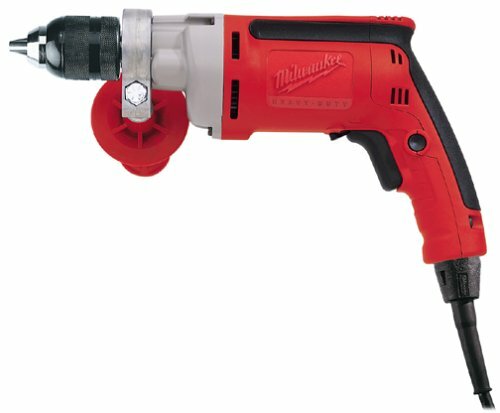 If you are looking to buy a strong corded drill,look at Milwaukee first. I have had this model for over a year now and am ordering another for a gift to my electrician friend. I was amused by some of the reviews - Joe's in particular. This is a great drill. I used (abused) the predecessor with keyed chuck for over 20 years before replacing it with this model last year. Joe - the cord is wonderful the way it is. It disconnects for easier replacement. Over the 20+ years I replaced the cord on the last one twice. The handle (sissy bar) sticks out that far for added leverage. Put a 4" hole saw on this baby and it has enough torque to break your arm. Since I am a contractor I use a hole hawg for mixing drywall mud and heavy stuff. I use my three cordlesses for most light drilling and srewdriving. I use a SDS hammerdrill for concrete. However - I have used these magnums for all of the above when it was more expedient or the more proper tool was not close by. This thing can do it all, do it well and do it quickly. It's relatively small size might be misleading. I recommend the proper drill for your job at hand as mentioned above but I cannot imagine a better all-round tool for a homeowner who does not have all the drills I do. Joe - don't badmouth a great tool because you do not know how to use it's design features. This drill works well; is sturdy and strong; chuck grips the bits well. I am not sure what the removeable cord does for it though. I also wish it had some sort or "hook" or "loop" to use for hanging it on ladders or a tool belt. I also wish it were made in USA - I thought it was when I ordered it. I also wish the clamp-on handlebar has the grip closer to the drill instead of extending out so far. Best 1/2 inch chuck. Very easy to use yet grips with tremendous force and releases easily. Best variable speed circuitry and trigger. Very smooth continuous speed control over entire range. Best power for its size (8 Amps!) I have used many other corded drills. This is the best by far. One definition of an expert is someone that makes what he does look simple and easy. This drill does exactly that. Plenty of power whether you're drilling into concrete or wood. It is deceptively light and slim and easy to hold and use. Very satisfied and highly recommended. My only gripe is that it does not come with a case. What's up with that Milwaukee? A simple plastic case wouldn't cut into your price point. Still it's a 5 star product. 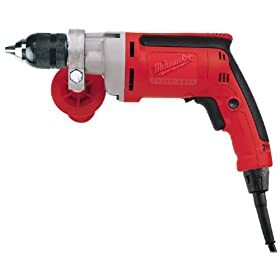 Follow up: I mostly use my incredible Panasonic cordless drill and reserve this one for when I need a more aggressive bite. I like Milwaukee tools, but am sorry to report that after minimal use, the clutch in this seems to be fouled up already! I imagine it's still under warranty, but how a clutch can break after such light use makes me change my recommendation and discourage anyone interested from buying this drill. Now I'll see how good their customer service is and will report back later. If you can deal with a cord, you can't do better than this drill. It's very impressive. Amazon is selling them a little high, so check around. I got mine on ebay for $80 brand new. Great Drill For Garden Auger! I bought this drill to use with a 2.75" x 26" Bulb/Plant Auger and a 4.75" x 26" Planting Auger, both of which I purchased from Gempler's. The keyless chuck makes it easy to exchange these augers and holds them in securely. This is a powerful drill which makes using these augers a snap for drilling holes in the ground. But you do have to hold on securely. If you hit a rock or tree root, the drill will catch and spin your wrist around if you are not careful. I also bought two 50 foot, 12-gauge three-wire, grounded extension cords for work farther out in my backyard, and the drill works fine. I'm buying a lot more plants for my rock garden and butterfly garden because planting is so much easier now. Great Product! The other reviewers have given a thorough appraisal of the product so I won't go into the details. But if I could I would give this a 6. Its the best non-battery drill I have. The power is unbelievable and the drill has lots of little features that make it a joy to use. I also have a Milwaukee router that I equally love to work with because it is so well designed and the workmanship is far better than anything else I have seen, just like on the drill (you know thats not going to last if the bean-counters take control). I have Porter Cable and Delta tools and I wont ever buy those brands of tools again because they fall apart, are poorly designed and made,and work poorly as well. After you own a Milwaukee tool (at least the drill and router)you won't ever go back to Porter Cable. I gave my Porter Cable 690 router to an acquaintance (I wouldn't do that to a friend).